More than 20 of Long Island’s best authors will be at Martha Clara Vineyards on Sunday, April 22 from Noon until 4 PM. 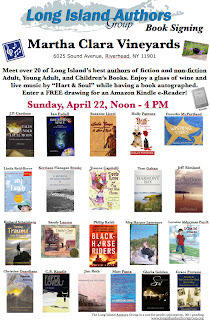 Long Island Authors Group www.longislandauthorsgroup.org, will have an array of authors whose works include fiction and non-fiction Adult, Young Adult, and Children’s Books at Martha Clara Vineyards in Riverhead, Long Island, NY. Admission to the book signing event is free and open to the public. It will feature live entertainment by “Hart & Soul”. Everyone who attends the book fair will be eligible to enter a free drawing for an Amazon Kindle e-Reader, courtesy of the Long Island Authors Group. "Martha Clara Vineyards has been the perfect venue to host our annual book fair. What a great way to spend the afternoon, sipping wine, meeting new and exciting authors, and relaxing with a really good book," said LIAG’s president Kerriann Flanagan Brosky. "Our authors consist of commercially published, small press published and self-published. They bring a unique diversity to the world of literature, and we're happy to showcase them at such a beautiful location." Authors attending include: Loraine Alderman, PhD, Kerriann Flanagan Brosky, Yvonne Capitelli, J.P. Cardone, Ian Fydell, Tom Gahan, Gloria Golden, Christine Guardiano, Philip Keith, C.P. Knadle, Meg Harper-Lawrence, Sandy Lanton, Suzanne Litrel, Dorothy McPartland, Matt Pasca, Holly Patrone, Grace Protano, Linda Reid-Bryce, Jeff Rimland, Jim Roth, Richard Scheinberg. Update To My Last Update! Hey! I hope this finds you all well. I'm loving this Long Island weather- anxiously awaiting spring, but not complaining about how mild it's been. I'm also looking forward to spring for a few other reasons- I wanted to give a little notice on a few events coming soon. Saturday March 31 at 2:00 I will be at the Riverhead Free Library. I'll talk about the book and answer questions. I hope I'll see some old friends there and meet some new ones. Registration is opening February 19 on the Riverhead Library website http://www.riverheadlibrary.org/ It should be fun! The highlight, I'm sure, will be to watch me sign books after a glass or two of wine! It'll be fun ! I know some people haven't signed up for notifies on this blog (and my other at http://www.homeschoolerbyaccident.blogspot.com ) because the process is limited to a few profiles, but now you can sign up with an email address! Yeah! So please do so (don't be shy!) and if you would, please forward this email to other people you think would enjoy this or my homeschooling blog. Also if you missed the Blogtalk radio show- you can catch it here- http://www.blogtalkradio.com/jennifer-walker/2012/01/04/a-cup-of-coffee-and-a-good-book See if you can count how many times I say 'ummmmmm' especially in the first 5 minutes! After the initial terror, I think the rest went ok. Let me know what you think.